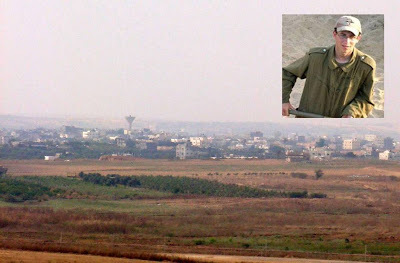 To give you some idea how far Hamas terrorists tunneled to kill and kidnap Jewish soldiers, this picture of a Gaza town was taken from that same Israeli outpost that was attacked by Hamas. In September 2010 Hamas terrorists released video of two terrorists threatening to kill kidnapped Israeli soldier Gilad Shalit. A deal has been reached which will see Israeli soldier Gilad Shalit freed by Palestinian militants. Israel’s prime minister Benjamin Netanyahu says Mr Shalit will return home in “the coming days. He was kidnapped on the border with Gaza in 2006. Previous negotiations to secure his freedom have all broken down, however now the Israeli cabinet is meeting to discuss an agreement with Hamas. It is believed it will involve a swap deal for Palestinian prisoners, however Sky’s Middle East correspondent Emma Hurd says there is no confirmation of the number of inmates involved.